Mardel Wilkens, 4, and George Wilkens, 5. Boy on decorated bicycle catching a tuna. He is Donald Baumgart. Babe Tapley on Shetland pony. Majorette Beth Ann Robertshaw, 6, performing before audience. 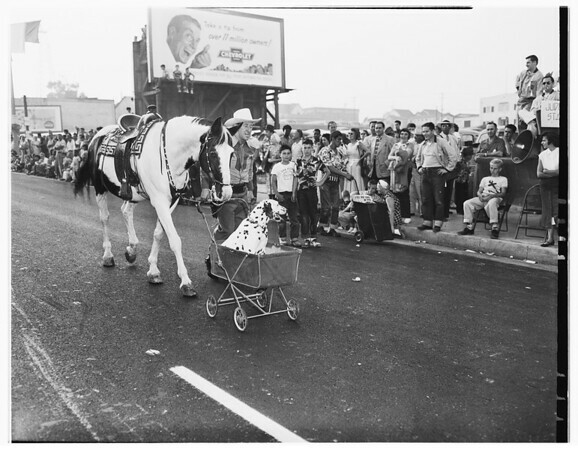 King, a trained horse, pushing Junior, a dog, in a baby carriage. Owner of the horse and dog is John Sonney. The San Pedro Junior Chamber of Commerce float in parade of Abraham Lincoln making a plea for freedom".